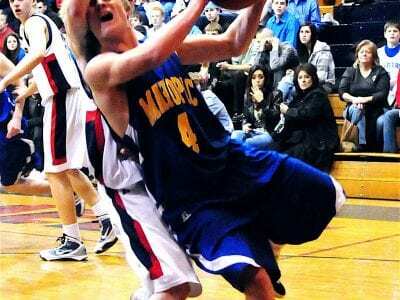 Kevin Carey of Mahopac takes a hit as he goes to the basket. SOMERS—A hustling Kennedy Catholic boys basketball team put the pressure on early, and applied it often Saturday night, holding off a never-say-die Mahopac squad and walking off the c… Please login below or purchase a subscription to the Putnam County Courier to access this content. BREWSTER—The Brewster High wrestling team turned in a strong showing at the John Jay wrestling tournament last weekend, placing second to Fox Lane. John Jay of East Fishkill took third. Liam Erickson of Brewster won the 96-pound weight-class… Please login below or purchase a subscription to the Putnam County Courier to access this content. 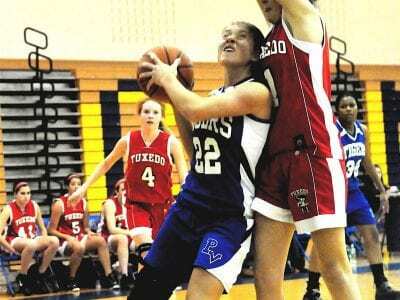 Right: Putnam Valley’s Amanda DeChent does some heavy lifting under the basket against Tuxedo. PUTNAM VALLEY—The Putnam Valley High girls basketball team went into Walter Panas and left with a 44-35 victory on Monday. Saturday the Tigers … Please login below or purchase a subscription to the Putnam County Courier to access this content. MAHOPAC—The Mahopac High wrestling team continued its strong start to the season on Saturday by finishing second out of eight schools at the Woodlands High School tournament in Hartsdale. That followed the opening of the Section 1 Dual Meet … Please login below or purchase a subscription to the Putnam County Courier to access this content. CARMEL—The Carmel High wrestling team won both matches in the opening round of the Section 1 Dual Meet Tournament last Thursday, beating John Jay EF (45-33) and Tappan Zee (36-33). But Carmel’s winning streak ended Monday, when the Rams … Please login below or purchase a subscription to the Putnam County Courier to access this content. SOMERS—Competing against schools from all over Section 1, the Kennedy Catholic winter track team opened its season Sunday as part the Armory’s Kick-Off. The two day competition is made up of nearly every team from the section, and the Gaels ar… Please login below or purchase a subscription to the Putnam County Courier to access this content. BREWSTER—The Brewster High boys basketball team wasted a golden opportunity against Hen Hud in the opening round of the Jack McGuire tournament, and it ended up costing Brewster the game, as the Sailors went on to post a 52-46 victory. The Bea… Please login below or purchase a subscription to the Putnam County Courier to access this content. 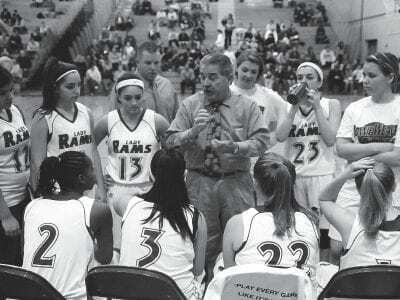 Carmel coach Dan O’Hare and the Rams came up short against Mount Vernon last CARMEL—Carmel girls basketball coach Dan O’Hare was anxious to see just how his Rams stacked up against the team many are picking as the early favorite to … Please login below or purchase a subscription to the Putnam County Courier to access this content. MAHOPAC—The Mahopac High ice hockey team continued its strong recent play by defeating Ossining on Saturday, 4-1, in a conference game at the Westchester Skating Academy in Elmsford, bringing its overall record to 4-2 with a 4-1 conference rec… Please login below or purchase a subscription to the Putnam County Courier to access this content.